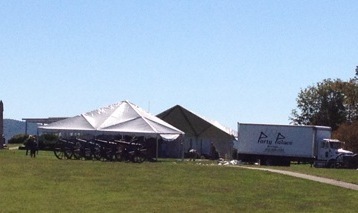 Workers from The Party Palace set up tents near the battlefield visitor center earlier this week. Antietam National Battlefield has been abustle all week in preparation for this weekend’s commemorative activities surrounding the sesquicentennial of the battle. The NPS and several partner organizations have an impressive slate of events planned. Things get underway the morning of September 14. Emerging Civil War will commemorate the anniversary of the battle with content updated throughout the day on Monday, September 17. This entry was posted in Battlefields & Historic Places, Battles, Civil War Events, Emerging Civil War, Sesquicentennial and tagged Antietam, Battle of Antietam, NPS, Sesquicentennial, Shepherdstown, South Mountain. Bookmark the permalink. This is so perfect! What a resource you have created–thanks from all the students in the world!